It’s nesting season for loggerhead sea turtles on North Carolina’s Gull Island. Nine-year old Tara (or Sweet T as her family sometimes calls her) is determined to see hatchlings make it safely from their nests to their ocean home.Summering on Gull Island with Great Aunt Mae could be tons of fun, but T is having a hard time making new friends with island children, let alone finding kids to help her monitor a sea turtle nest.There’s little sister Jenna, but Jenna is, well, little. Fuzzy is around, too, but Jenna’s blue stuffy rabbit gets lost all the time. Besides, a toy bunny can’t help protect turtle nests.Tara befriends Billy, a moody island child. He teaches her skimboarding and shows her the best shelling spots. But Billy stomps away when she asks him to read the “Turtle Team Guide” and join her in saving baby sea turtles.What’s up with Billy? He’s nice one minute and grumpy the next. And why does he refuse to join T’s Turtle Team? T can’t figure him out. A tropical storm threatens Gull Island just as the sea turtle nest is ready to hatch. T must abandon the nest and prepare for bad weather. Will Sweet T and her friends keep safe from the storm? Will the sea turtle nest survive angry ocean waves? Will Billy reveal his secret? Dive into adventure, fun and secrets on Gull Island with “Sweet T and the Turtle Team” to find out! 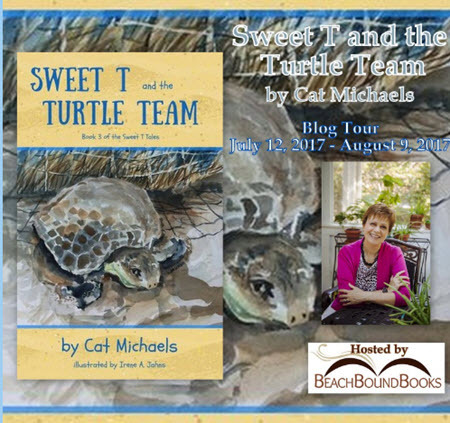 “Sweet T and the Turtle Team” is the third book of the Sweet T Tales Series of chapter books for early and reluctant readers by Cat Michaels, MS., Ed. 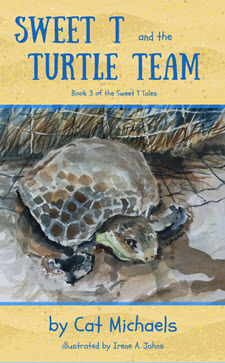 With a glossary, comprehension quiz, sea turtle hatch photo gallery, and discussion questions, “Turtle Team” delivers powerful messages about protecting marine life while helping young readers empathize with children who struggle to read. Sweet T and the Turtle Team is a chapter book for young readers. It’s about a girl who is on Gull Island with her family during her summer vacation. It starts out kind of boring but she soon makes friends and becomes part of a Turtle Team and her vacation turns out to be a fun adventure. 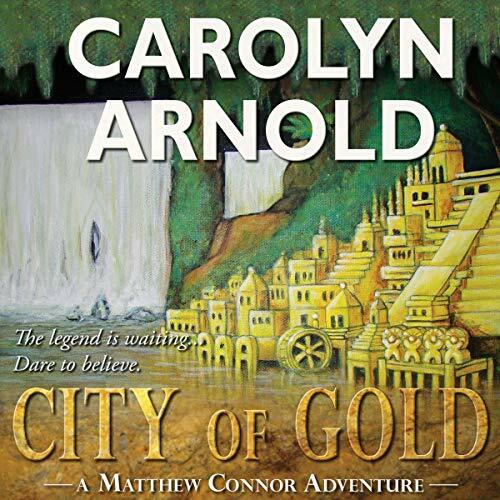 Cat Michaels has a great writing style that is simple enough for children to read but I enjoyed reading it as well. Occasionally, there was a page titled, “Texts from Kristen.” Kristen is T’s sister and stayed home with their dad. 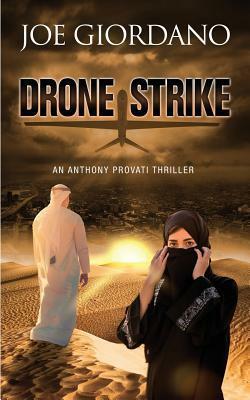 The texts are a great way to “modernize” the story. There are also watercolors throughout the book that help to enhance the story. The best part of Sweet T and the Turtle Team was learning about turtle nests. On a nature channel, I saw turtles emerging from their nests and the dangers they faced while heading toward the water and even once they got into the water. I had no idea that there were teams that helped them on their journey! It was interesting to read about the turtles and to see the photos of the baby turtles at the end. Sweet T and the Turtle Team has it all: a great story, nice illustrations, and an opportunity for children to learn about turtle nests and dyslexia. At the end, it has photos of baby turtles, questions to answer, and a glossary of text terms. Terms and Conditions: NO PURCHASE NECESSARY TO ENTER OR WIN. VOID WHERE PROHIBITED BY LAW. A winner will be randomly drawn through the Rafflecopter widget and will be contacted by email within 48 hours after the giveaway ends. The winner will then have 72 hours to respond. If the winner does not respond within 72 hours, a new draw will take place for a new winner. Odds of winning will vary depending on the number of eligible entries received. This contest is in no way sponsored, endorsed or administered by, or associated with Facebook. This giveaway is sponsored by the author, Cat Michaels and is hosted and managed by Stacie from BeachBoundBooks. If you have any additional questions feel free to send an email to stacie@BeachBoundBooks.com. Thank you for your wonderful review. I am happy you enjoyed the book! Sweet T and I are over the moon that you visited Gull Island and helped the turtle team protect fragile nests and hatchlings. T says she’s glad you liked the illustrations and text messaging parts, too -:D. I’m waving here from Gull Island, along with the rest of the turtle team, and sending heart-felt thanks for your lovely review of our tale!